Cynthia was thrilled with the refurbished canopy bed. The 18th century English four poster had been in sad shape when she bought it at an estate sale in San Francisco a year ago. Three of its finials were missing, one of its posts was cracked and much of the elaborate carved trim was also missing. The big Victorian house on Nob Hill, where it had been for many years, and because it had suffered a good deal of earthquake damage, its elderly owner sold the house and all of its furnishings. Since the bed was in such poor condition, it was marked at a surprisingly low price. Cynthia's sister Suzanne, an interior designer, assured Cynthia that she knew just the right person to repair the damaged frame. She also knew of an upholstering firm who, with their fabric magic, would transform it into the grand canopy bed that Cynthia had dreamed of. Cynthia, an accomplished concert pianist, had recently moved to New York City from her native California. She had found a small but beautiful corner apartment on West 64 Street with a lovely view of Central Park. During the past months, she and Suzanne had worked together to create the elegant bedroom that Cynthia had envisioned. They looked in vain for a dressing table of the right size and design to hold its own alongside the imposing four poster. 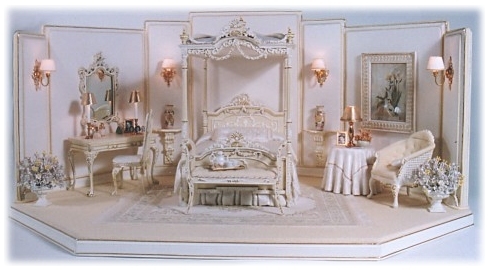 When Cynthia found the impressive writing desk and matching chair, she called her sister, who agreed it would be perfect, and, yes, it could be painted to match the 'wedding cake' bed. When all the pieces for the bedroom were finally in the apartment, Suzanne flew to New York to help her sister with the choosing and placing of accessories, Cynthia could not have been more pleased. But she had one last bit of frosting to announce: She would be giving a concert at Carnegie Hall!